We supply the Presscomfort branded as the Optimatic 22 - do not worry, other than the name these pressure regulators are completely identical. 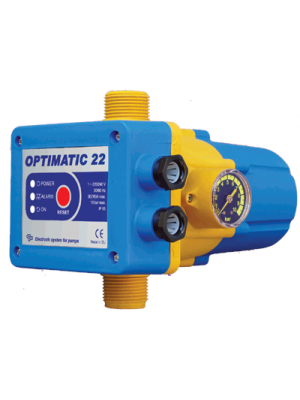 Optimatic 22 is an automatic pump controller, which starts and stops the pump ‘on demand’. When a valve or tap is opened on the outlet side of the control, Optimatic 22 senses the drop in pressure and instantly starts the pump. When the valve is closed the pump continues to run for a further 10 seconds to prevent water hammer, and then stops ready for the next demand for water. If the pump runs out of water during operation, Optimatic will automatically shut down the pump to prevent damage. Once the water supply is restored the Optimatic 22 automatically re-starts the pump.